Posted on October 24, 2014	by Derek "Gamer Crash"
If one thing is very clear, Nintendo is all in with Super Smash Bros. Seeing this as a legitimate opportunity to not only steal the spotlight from other AAA games/platforms, but to actually move hardware as well, Nintendo poured even more hype over a frothy and very excitable crowd yesterday with their latest Nintendo Direct. As you can probably imagine, yesterday’s Direct focused squarely on Super Smash Bros detailing an absurd 50 things you need to know about the title. Considering the 3DS version is already out and Nintendo has detailed this game at length in the past, it’s still amazing to learn that there’s just still so much we don’t know about this game. The trailer focused on a lot of exclusive WiiU features and additions. While I’m not going to pour over every single item, here’s some of the bigger announcements from yesterday’s Direct. As a bonus, I’ve also added the video so you can hear Mr. Announcer Man detail each aspect of the game if you want. Enjoy! 1. MewTwo returns to both the 3DS and WiiU titles as free DLC if you own both the WiiU and 3DS versions of the game. I’d assume Nintendo would eventually offer him as paid DLC, but no announcements on that. 2. Bowser Jr got his own trailer and he was also joined by the Koopalings as well. It wasn’t explained well, but I’d assume they act as his costume swaps or something to that effect. 3. Do you enjoy chaos? 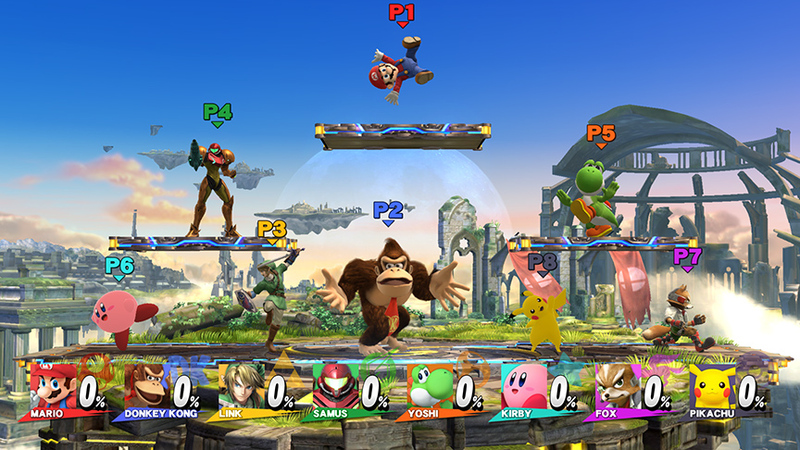 Smash for WiiU now allows more than 4 players to battle in the same match. The peak of the action caps out at 8 players which, I can’t even fathom how insane that would be. Obviously, to support the match size, only the large maps will be selectable and the 8 players are locked into local multiplayer, not online. 4. Stage Builder has been confirmed. 5. Masterpeice Mode lets you play demo sized chunks of classic Nintendo titleslike Kid Icarus, Kirby’s Dream Land and others based on the character roster. 6. So many modes! Master Orders, Crazy Orders, Target Blast, Stadium Mode, All-Star Mode, Event Mode, Special Smash Mode and Smash Tour to name a few. 7. New exclusive stages in the WiiU version with some existing ones being altered to fit better on the WiiU. 8. 40 fighters available to fight with more to be unlocked or grabbed via DLC. This entry was posted in News and tagged 3DS, games, news, WiiU. Bookmark the permalink. 8 player smash bros? …I need to find more friends to smash! It’s going to be way too awesome! I know right, that’s going to be the biggest problem for many I think. Aw man, this would have been AMAZING for college!